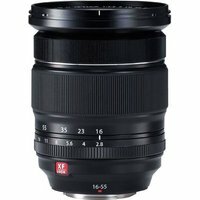 The Fujifilm 16-55mm f/2.8 R LM WR Fujinon lens is a weather-resistant, wide-angle to medium telephoto zoom with Fujifilm X-mount. From sweeping landscapes, candid portraits and everything in between, the lens features a versatile focal range and a constant f/2.8 aperture to ensure ultra-sharp images across the entire zoom. The lens' advanced optical construction reduces ghosting and flare, whilst the linear motor allows for comfortable shooting with fast, quiet autofocusing.